Mayor Michael Bloomberg calls for legislation to make New York the first U.S. city to require stores to conceal tobacco products. Watch his statement. If New York City Mayor Michael Bloomberg gets his way, stores won't be able to publicly display tobacco products and will have to keep cigarettes under the counter or behind curtains. The legislation announced Monday is the latest public-health crackdown by the mayor, whose ban on super-sized sugary soft drinks was shot down by a judge last week. The proposed law would "prohibit display of tobacco products" in most retail shops, Bloomberg said. "Such displays suggest smoking is a normal activity and invite young people to experiment with tobacco." He said it would be the first of its kind in the nation. A second law would impose new rules to make it harder to sell smuggled cigarettes. "These laws would protect New Yorkers, especially young and impressionable New Yorkers," Bloomberg said at a Queens hospital, adding that a decline in youth smoking has stalled out with about 8 percent of young people lighting up. He said he hoped the City Council would reject the bill after it’s introduced later this week. If it passes, the National Association of Tobacco Outlets predicts it will be overturned by the courts. “Retailers are responsible business people that go to great lengths to prevent sales to minors, and there are First Amendment protections that extend to advertising,” said Tom Briant, executive director of the group. After the town of Haverstraw in upstate New York passed a similar ordinance last year, retail and tobacco groups sued and the board repealed it. Sunny Parikh, who has operated a Midtown Manhattan newsstand for 20 years, wondered where he would put the cigarettes he sells, which are in slots at the top of his cramped kiosk. He also questioned whether the initiative would reduce youth smoking. “If kids want to smoke, they’ll find a way,” he said. City officials, though, said the point of the display ban isn’t to prevent kids from buying cigarettes, which is already illegal; the idea is that lowering exposure to the products reduces the chances a young person will try smoking in the first place. Bloomberg has made public-health campaigns a hallmark of his administration and boasted that life expectancy in the city is up three years since 2001. He has also crusaded against salt in restaurant foods and junk food in vending machines and required calorie counts on fast-food menus. 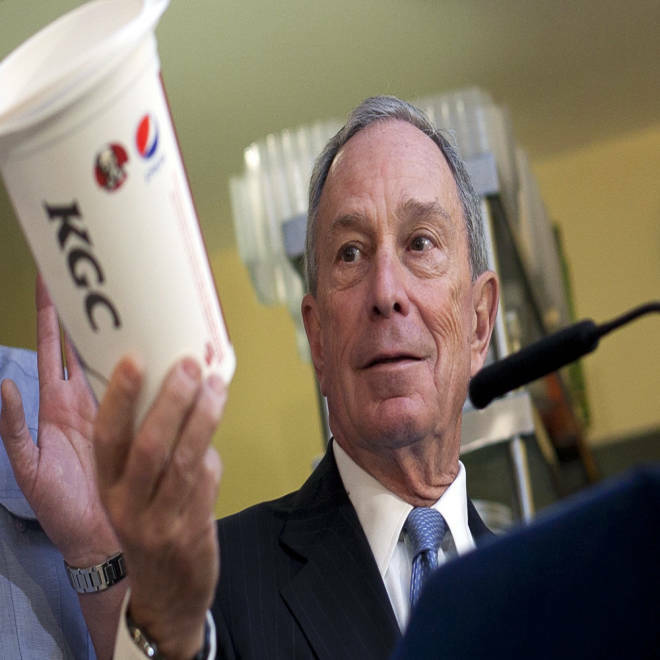 New York City Mayor Michael Bloomberg, seen here holding a super-size soda cup while promoting a crackdown on sugary drinks, has announced a new public-health campaign to shield cigarettes from public view.